WIP Wednesday And A Few Thoughts…..
First off, I’d like to extend and gigantic “thank you” to those of you who left such kind and thoughtful comments on my post about judged quit shows! I decided, after feeling this nagging sense of discomfort around that post all day yesterday, to remove it from my blog. In doing so, I lost all the comments that were made on it :-(. So if I did not get a chance to thank you via email, I hope you will see it here. The short version of why I removed the post is this; I simply feel like it is too personal an issue and one with too many subtleties that I find difficult to articulate in the time I have for writing blog posts (very little). I felt it was a post that could so easily be perceived in a number of not so positive ways and it was simply making me feel uncomfortable. I am so happy and feel honored to have had my quilt recognized with an award! I’ll just leave it at that for now! I apologize to those of you who have no idea what I’m talking about because you did not read it yesterday, but I felt I needed to clear that up for those who may have been wondering. Now, on to my little WIPs!! I finally finished the quilting lines on my Dreamcatcher Quilt. I can’t wait to show you the whole thing, but I will wait until the binding is complete!! 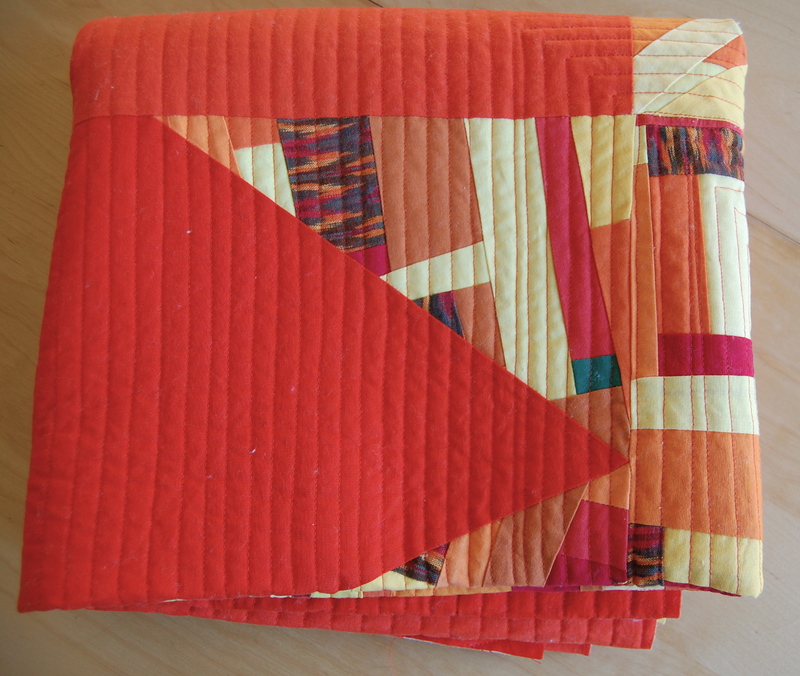 I know you’ve seen this quilt now for a few weeks in a row- yawn right? My goal is to have it finished by Friday for one last reveal!! 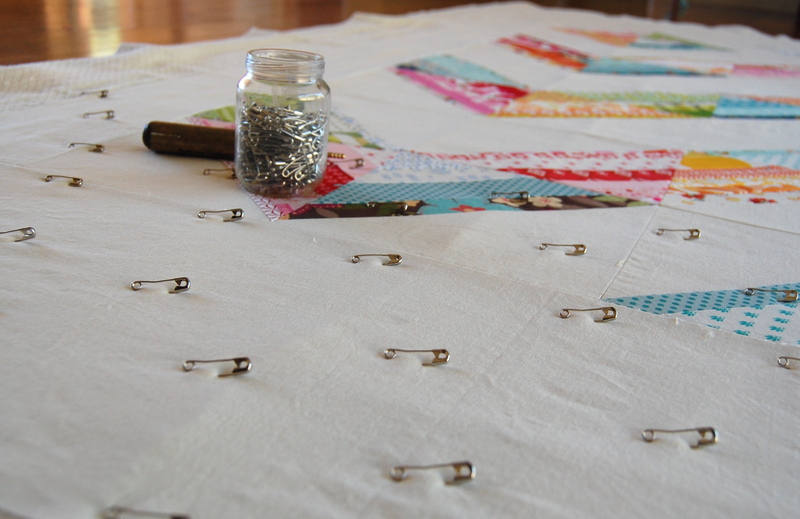 When I finally got all the basting pins out of that quilt, I was ready to move on to basting Miss A’s Bed Quilt, which I pieced a while back using my Scrappy Strings HST method. 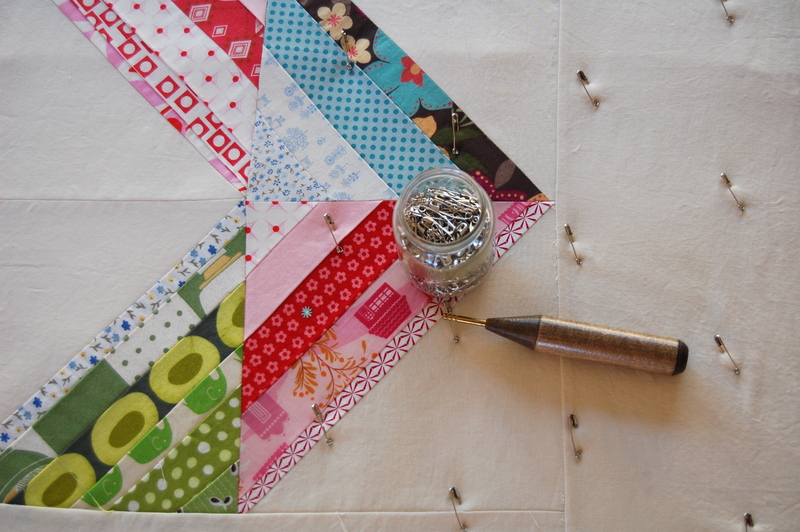 I love this quilt top so much and can’t wait to get it quilted. Since Miss A has been home sick this week, now on day three and feeling better, she was able to help me pin- and wanted to snap some photos! I have decided that this will be my first hand quilted (well not entirely, I’ll quilt the negative space with my walking foot- of course) quilt project. I have been so inspired by Svetlana’s work and I found this great tutorial. I have been wanting to hand quilt for a while now and just needed the right quilt! I’m linking up to Lee’s WIP Wednesday. Stop on by and have a look lots of pretties as usual. I’m going to get back to my basting duties, I have a bit of work ahead of me as you can see! Hope your day is full of loveliness…….. I was one of those who read your post yesterday and felt it was very thoughtful and honest. I never thought for a moment that it had a negative tone (but I do respect your decision to remove it from your blog). That being said, the VMQG saw pictures of QuiltCon taken by Kelly @ Superbuzzy on Monday night, and everyone was absolutely DELIGHTED that you entered your beautiful quilt and won the award…and we are proud to have recognized your talent as an artist early in your quilting “career” and had the sense to ask you to speak at our (small) guild. Thank you! Ah, basting takes so long! That is a really lovely quilt, though. I can’t wait to see how you quilt it! 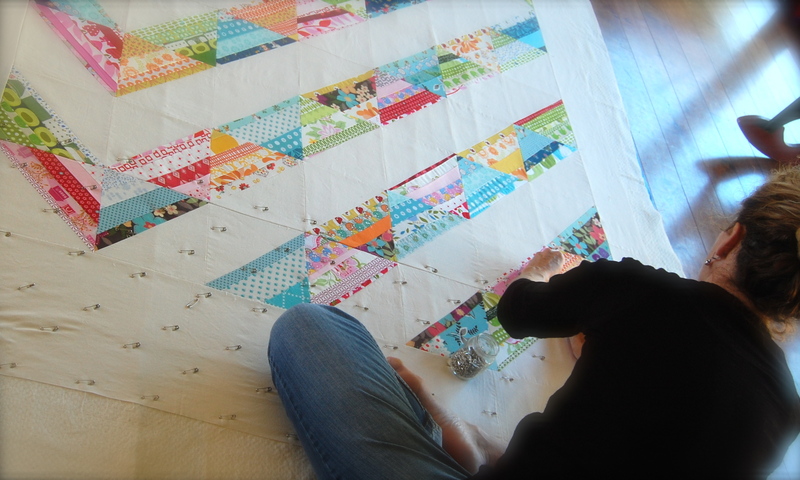 I like how happy and bright the quilt is that you are basting. Second, I am one of those who has no idea what your last post was about (darn curiosity is nagging too!). I appreciate that you took your post down after you decided it could be understood in a way you didn’t intend, but I don’t think the subject of quilt judging should simply be off limits. I’ve never submitted to a show but have thought about it, and I have no idea what to expect if I ever do. This quilt is absolutely beautiful. I can’t wait to see it all finished and how you decide to quilt it. I can’t wait to try out your tutorial! Very pretty quilt! Can’t wait to see the whole thing. 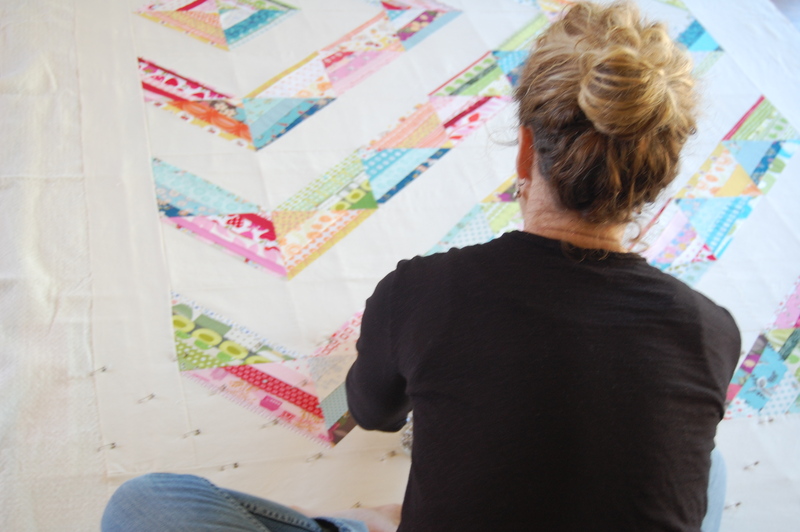 Wow – I can’t wait to see your quilt when it was done. I had read the post you deleted and appreciated your honesty. I also found it very interesting. But I understand why you deleted it. Take care. It’s gorgeous! Can’t wait to see the finished product! wow! miss A’s bed quilt is absolutely stunning!